Plastic, an ingenious and versatile solution to the demands of mass production, has become an environmental challenge of mass proportions. While swelling landfills are relatively easy to ignore, we've become increasingly aware of the threat disposable plastic poses to rivers, lake and oceans—a major source of human food supply, as well as a vital part of Earth's ecosystem. But if humans are resourceful enough to create plastics, perhaps we're creative enough to solve the problems of plastic pollution, too. These five articles discuss the growing trend of reusable and biodegradable alternatives. You can read these articles using CPL's Online Resources, but I've noted if an article is available freely on the web. 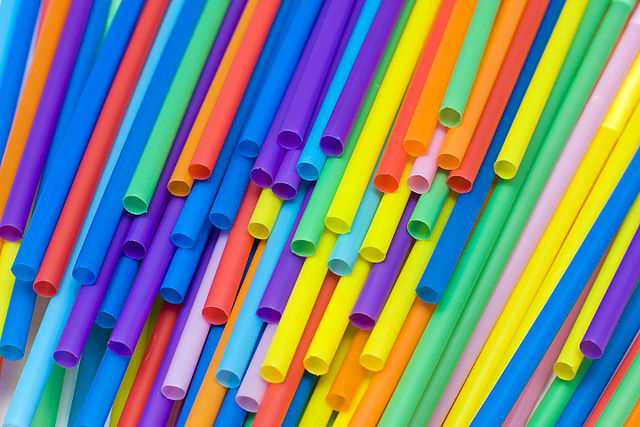 Advocates for business and people with disabilities have questioned whether a ban on plastic products like straws is the right solution, but experts suggest the consideration of bans (such as the advisory question on Chicago's most recent ballot) is an encouraging sign of rising consumer awareness of the problem. Meanwhile, several top businesses are making plans to phase out plastics in favor of biodegradable products while still accommodating the needs of their customers. "Starbucks Is Ditching Plastic Straws by 2020" details plans by the coffee chain and others. In an effort to cut down on disposable plastic pollution, students were given reusable bottles through a business/government partnership. Perhaps the most distressing symptom of the plastic pollution challenge are the giant islands of trash gathering in the world's oceans. A young college dropout helped launch an ambitious effort at cleanup. Can it make a dent? Plastic microbeads are one of many problems the beauty industry is dealing with, but researchers are exploring biodegradable alternatives.